Which is the best dogsled tour in Finland for you? Why go dog sledding in Finland? Our two options for dog sledding in Finland are a little different from our other dogsled tours in Sweden or Norway, which typically move between overnight locations. For our Finland tours, both have an accommodation base from which you explore the surrounding area on day tours, returning to the cabin each night. You do not need to pack/unpack your gear, clear the cabins/break camp, etc, each day. This can be both energy- and time-consuming, so sledding from a fixed location means you can really focus on the sledding and also allows you to really settle in to your accommodation for the tour and make yourself at home! Since there is no fixed minimum sledding distance to cover each day (as there would be on a point-to-point cabin tour, for example), tours can be very flexible to take account of factors such as weather, temperature and trail conditions as well as to a certain extent to adapt the level of challenge of the dogsled tour and distance covered to particular participants. The tours still offer a variety of trails to explore each day, which can be easily extended/shortened as necessary, meaning that sledding from a fixed base is by no means necessarily less varied than a point-to-point tour. For both of our Finland dog sledding tours, you return to your accommodation base after each day's sledding. Photo: PH. Our Finland dogsled tours take place either in Kainuu, in the east of the country near the Russian border, or in the far north of Finnish Lapland. You are an adult solo traveller or group looking for a reasonable-length dogsled adventure (4 days' sledding with optional extra sledding on departure day) in the far north sledding in a very remote area. You would enjoy the logistical advantages of a fixed base compared to moving overnight locations during the trip and some small luxuries such as LED lighting not normally available on wilderness cabin tours. You would like the chance to see the Northern Lights during your tour - being located in the far north, this experience gives very good chances to see the Northern Lights throughout the period in which tours are offered (December to late March, including Christmas and New Year). The Pallas-Ylläs National Park offers remote sledding in a winter wonderland landscape. Photo: PH. 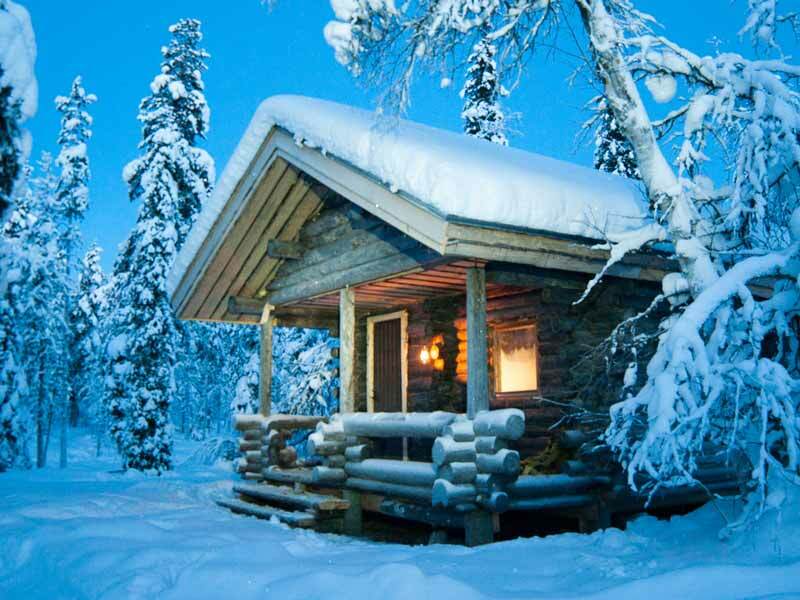 Accommodation is in a simple but cosy and comfortable cabin on the edge of Pallas-Ylläs National Park, a beautiful wilderness area of forest and fjells perfect for exploring by dogsled. Sauna by the lake is available each night at the cabin and although there is no mains electricity, simple LED lighting and also camera/mobile charging is available. A couple (or two friends happy to share twin room) who would like private sleeping accommodation, which is not normally possible on a multi-day dogsled tour. There is also the possibility to include the luxury of hotel accommodation - there are a number of itinerary options, either staying at the kennels on all nights or choosing hotel accommodation (in standard room or suite) at the start/end of the tour, and extra nights at hotel or extra days' sledding and kennel accommodation can also be added. Those who would enjoy the unique flexibility that can be offered by a private dogsled tour. As the only guests, the tour can be very easily adapted to suit your needs, with the option to drive own sleds or share with your partner, cover different trails each day or practise your favourite, be out sledding for longer or shorter periods, etc. This is a great option for real dog lovers - some of the dogs even sleep in the cabin! Photo: RT. A very personal and small-scale experience, this tour brings you into the home and life of your hosts' to really experience what it is to be a musher and get to know the dogs at this small kennel. 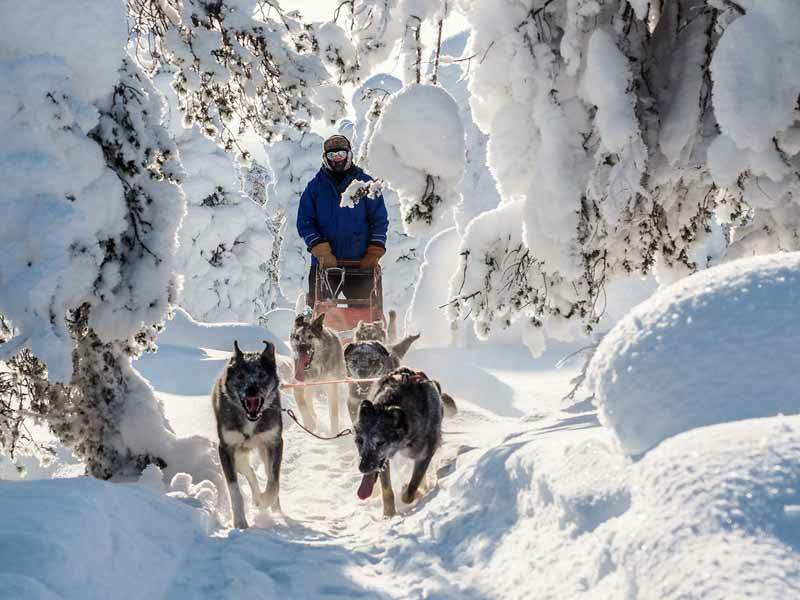 Located in eastern Finland, you're unlikely to see the Northern Lights on this tour, but the warm hospitality of your hosts, the very special atmosphere of the kennels and the beauty of the surrounding winter landscape makes this a unique dogsled experience.